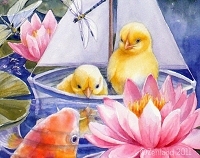 One fine summer morning, Ferdinand and Nina, two little chicks from Tulipa Farm, discover a toy sailboat at the edge of the garden pond. Not having seen a boat before, they wonder what it is. Ferdinand hops inside for fun and Nina follows him. But before they can jump out again, the wind blows the boat away from shore. Thus begin The Adventures of Ferdinand and Nina on Botanikah Pond. 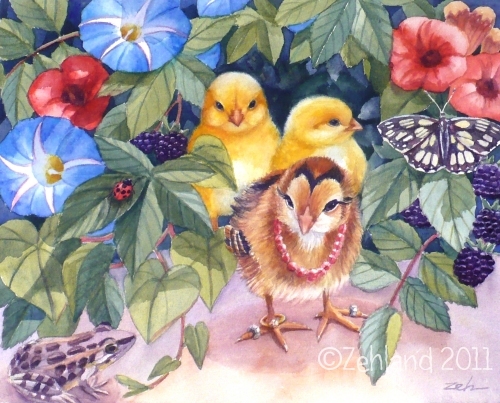 They see many new sights and make interesting friends such as Gustave the koi fish who is the most ancient creature of the pond, Princess Agnes Araucana who leads them to her magic castle and even tiny ladybugs who tell them which berries are good to eat. But there are dangers too, as they discover, and it is only through the efforts of their new friends of the pond and old friends at home that they finally sail back to Tulipa Farm. "Welcome to the Kingdom of Araucana." Nina looked up to see an elegant chick standing beside her.